The long held romantic view of the ocean as a compelling metaphor for the sacred mysteries of nature has recently been contradicted by a countervailing imagery of the slow violence of ocean pollution. In Ocean Imaginaries artists provide complex responses to global oceans in our era. 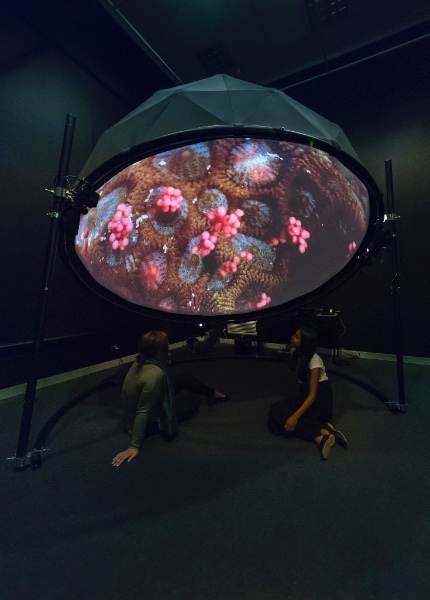 Exhibited for the first time in an art gallery, Australian artist Lynette Wallworth’s major work for fulldome digital planetariums Coral, Rekindling Venus (2012) transports the urban viewer to the mysterious realm of fluorescent coral reefs, providing a glimpse into a magnificent environment threatened by climate change. Under Lynette Wallworth’s fulldome artwork Coral Rekindling Venus, at RMIT Gallery. Photo by Mark Ashkanasy, 2017. Click here to listen to Lynette Wallworth talk about the environmental issues threatening coral. 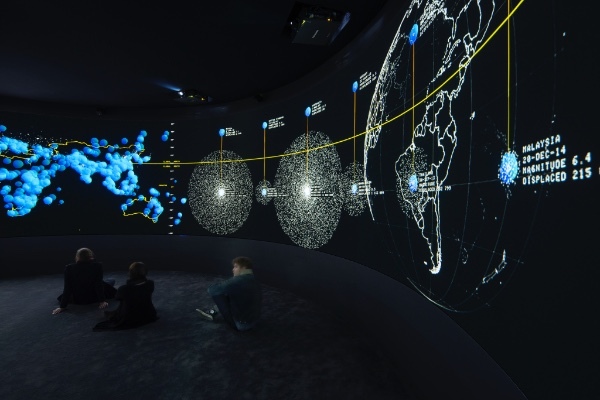 EXIT holds a dramatic mirror to contemporary global concerns. This outstanding work stunned audiences in Paris during the 2015 climate negotiations. Not to be missed!